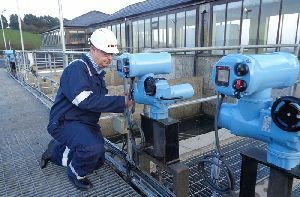 As part of a major modernisation programme at the Kilkit Water Treatment Plant in County Monaghan, Irish Water has installed Rotork’s intelligent CKc range of modular electric actuators at the site. In a contract awarded to Rotork by Coffey Water Ltd., inlet penstocks have been automated with CKc actuators to provide reliable on/off control, position monitoring and data logging of operating history to support asset management. CKc actuators were selected as they offered a fully compliant and cost effective solution to meet the desired specification of the application, which included a quick delivery schedule. In addition to supplying, installing and commissioning the actuators, Rotork’s responsibilities also included the design and fabrication of the adaptation components required to automate the previously hand operated penstocks. Rotork worked closely with the contractor to provide a comprehensive and fully engineered solution. The penstocks are now fitted with CKc double-sealed actuators which are certified IP68 watertight and temporarily submersible (8 metres for 96 hours). Increased penstock protection is provided by independent torque and position sensing, continuous valve position indication, even during power loss, and a safe, motor-independent handwheel. CKc actuators incorporate the Centronik integral starter and control module providing local control switches, monitor relay and a datalogger enabling data extraction for analysis, diagnostics and asset management. CKc actuators also feature simple, rapid and secure commissioning and configuration using local controls or a Rotork Bluetooth® setting tool. The modular CK design provides flexibility to suit individual applications, whilst plug and socket connections between modules assist efficient installation, commissioning and maintenance. The penstock project is part of a contract for Irish Water to upgrade the Lough Egish Regional Water Supply which will see a €4.5 million investment in the Kilkit Water Treatment Plant to benefit approximately 12,000 consumers in County Monaghan. Once completed the upgraded treatment plant will have an increased design output of 5.5 million litres per day (MLD) which will ensure that current water demands can be met, with capacity to meet future development needs. Find out more about the CKc.